Ah, this is the very definition of corporate synergy. When Disney bought Lucasfilm for $4.4 billion in October 2012, the possibilities were endless. With multiple new Star Wars projects in the works, beginning with Episode VII in 2015 and continuing with stand-alone spin-offs in the subsequent years, many were wondering how else could Disney grow the Star Wars brand. That question might have a one-word answer: Pixar. 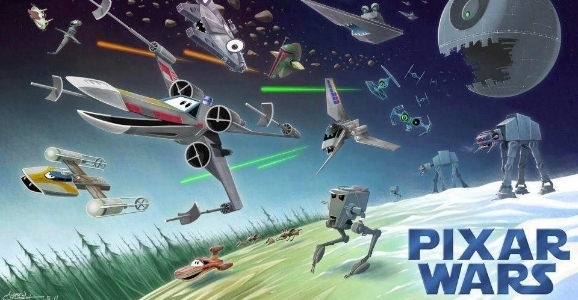 According to Latino Review, Disney is teaming up Pixar Animation with Lucasfilm to make an animated Star Wars movie. Not part of the new trilogy, this would be a stand-alone movie that exists within the evolving Star Wars canon. The Star Wars and Pixar brands are mighty powerful for children and adults of all ages, so this could only be a good thing for each company, if true. I never bought into arguments about Star Wars oversaturating the market. Has anyone complained that there have been so many Disney animated movies since Snow White and the Seven Dwarfs? Sure there have been some highs and lows in quality, but Disney has a proven track record of hiring smart, talented, passionate people and then letting them do their thing. Just look at Pixar, the Muppets, and the unprecedented success of the Marvel cinematic universe. Lucasfilm previously released an animated movie in the form of 2008’s Star Wars: The Clone Wars. Lucasfilm Animation made the film, with Warner Bros. handling distribution. Although the animated film was budgeted at $8.5 million, The Clone Wars only grossed $68.2 million worldwide. Thankfully, the film led to the animated TV series, which ran five successful seasons before being cancelled, with its sixth coming soon. The likelihood of Pixar making a Star Wars movie is pretty good, but until Disney, Lucasfilm, and Pixar send out an official press release saying “We’re Engaged!” take this with a grain of salt. That said, Pixar’s dance card is full until 2018 with an “Untitled Pixar film.” Currently, Pete Docter and Ronnie del Carmen have Inside Out slated for June 2015, while The Good Dinosaur was pushed from summer 2014 to November 2015. Andrew Stanton’s follow-up to Finding Nemo, Finding Dory, is expected for release on June 17, 2016. Meanwhile, Lucasfilm only has one movie confirmed in the pipeline at this point, Episode VII, which is slated for December 18, 2015. There’s also the Star Wars: Rebels animated series slated to premiere on the Disney Channel and Disney XD sometime this fall.